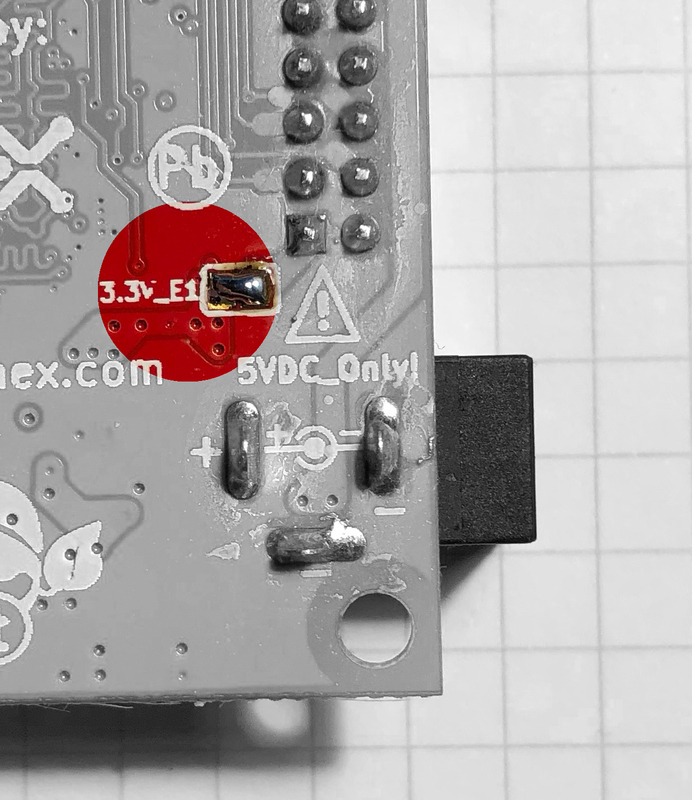 Olimex make a development board for the HX1K2. The board’s design is entirely open: it’s on GitHub3. 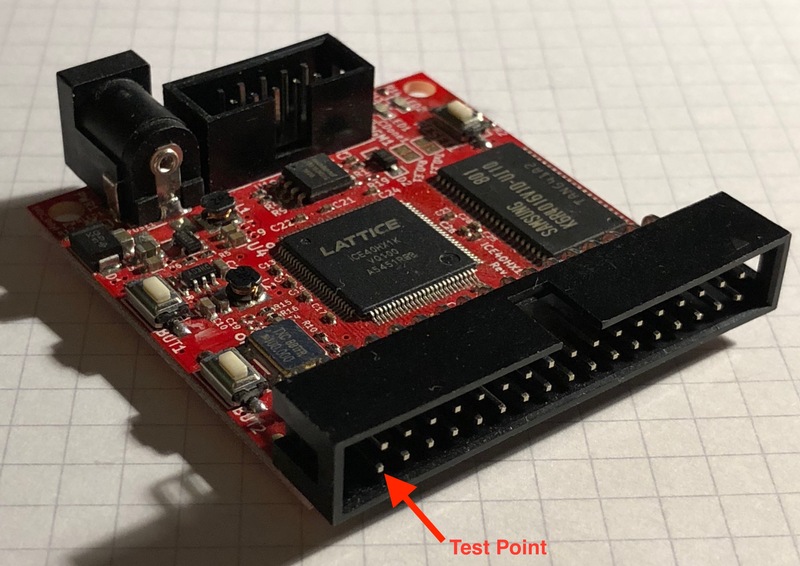 Unlike the boards from Lattice, it does not contain a programmer: rather Olimex suggest using one of their Arduino clones to do the task. There’s also no USB connection for a computer: it seems much more a standalone product. supplying power to the 3.3V pin on the programming header. The latter is most convenient, but you need to bridge an open solder-bridge on the bottom of the PCB to enable it. If you have a frequency counter to hand, measure the frequency on pin 34 of the IDC connector. You should see a 6.25MHz square wave. The board’s design is entirely open: it’s on GitHub7. 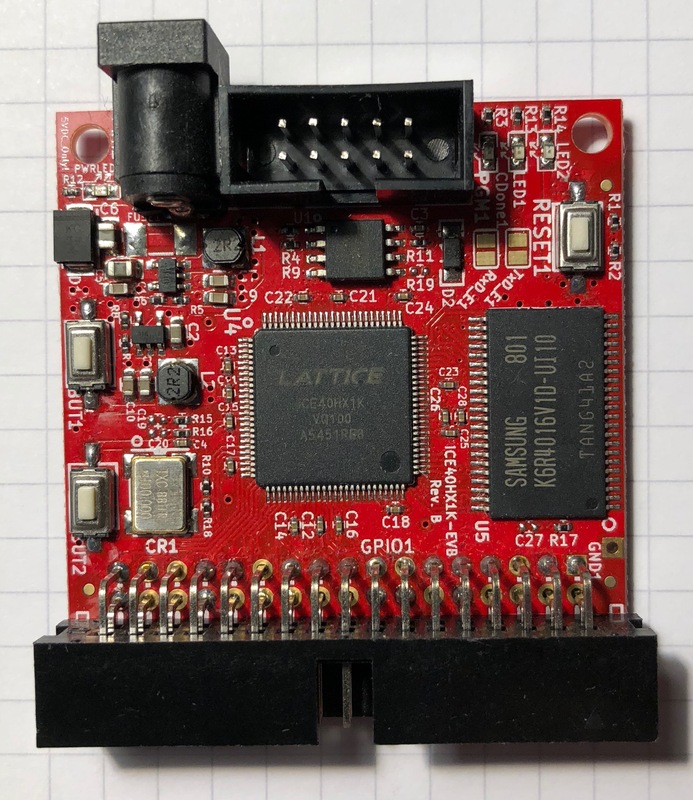 The FPGA is a iCE40HX-1K in a 100-pin flatpack. A 100MHz oscillator module drives pin 15. In this package the HX1K has no PLL. Two red LEDs are provided on pins 40 and 51. As befits the name breakout board, many spare IO pins exist, and we use pin 24 as a test point. Please remember that you can download all of this from GitHub8. There are only three files: the verilog, the pin definitions, and a Makefile. The code is very simple: there are just two LEDs and they flash at 1Hz. Olimex recommend using their Olimexino-32U49 board for this. 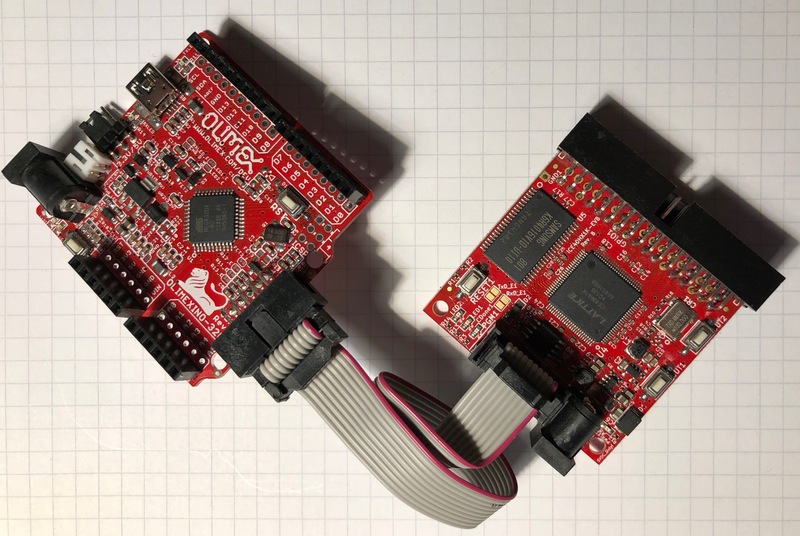 I think it’s roughly the same as an Arduino Leonardo, but it comes with a UEXT header which has precisely the right pin out for the programming header on the Olimex FPGA board. If you try to use a different Arduino, make sure it uses 3.3V signals, rather than 5V. The sketch for the board is in the FPGA board’s GitHub repo10, but you also need a particular SPIFlash library. More explicit details can be found on the Olimex website11. Revised by Martin Oldfield on 02 Mar 2018, original version 01 Mar 2018.